Solenopsis molesta molesta (Say). Drawing by Holly K. Coovert. This is one of Ohio’s smallest species of ants, and our most commonly encounteredSolenopsis. Named the Thief Ant because this diminutive ant often lives in close proximity to larger ant species and steals their food, a behavior known as lestobiosis. 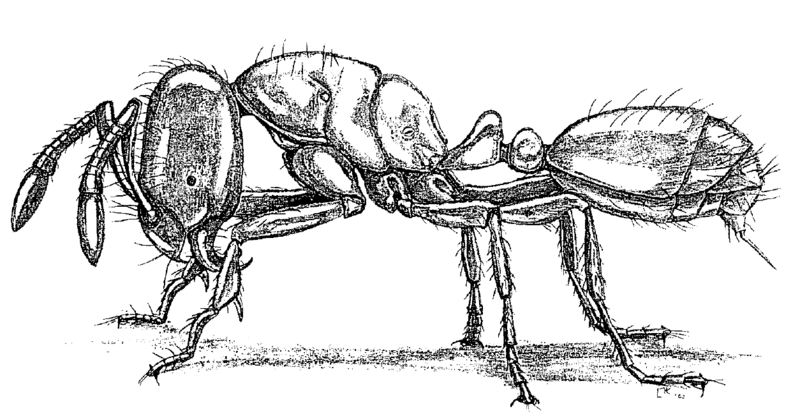 Because of their tiny size, they are usually ignored by larger ants. Yellow to yellowish-brown, head dorsally and gaster dorsomedially often slightly darkened; body mostly smooth and very glossy. The presence of the bare, non-punctate central longitudinal stripe on the head with the bordering hairs angling in towards each other, once seen, is diagnostic. This species is larger than S. caroinensis and tends to be darker in color than either it or S. texana. Colonies contain up to a few thousand workers (Thompson, 1990). Van Pelt( 1958) counted colony sizes in Florida, ranging from 60 to I 00 workers. With multiple queens (Wheeler & Wheeler ( 1986) reported a colony in Nevada with 23 queens). Queens can apparently carry workers on their nuptial flights, possibly to help found new nests. Found in open woods, fields, and meadows; occasionally a pest in buildings. Wesson & Wesson( 1940) report it "in rotten logs and stumps and under stones in woods and fields." Frequently taken at various baits; inside relatively fresh acorn (probably feeding - GAC 2124). Thompson ( 1990) reports they are highly predacious and nearly omnivorous. Workers were found foraging on ground in open, especially abundant at night on bait. A foraging column at base of linden (GAC 2133) was observed. 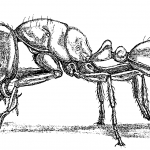 "Lestobiotic, usually nests in or near nests of other ants from which they rob food and brood." Under rocks or in ground. Wesson & Wesson (1940) note "Colonies of this species are often exposed while excavating the nests of other ants." "A house infesting ant and of great annoyance because of their small size; sometimes nests in woodwork and masonry of houses."